New York City's Lower East Side, long viewed as the space of what Jacob Riis notoriously called the "other half," was also a crucible for experimentation in photography, film, literature, and visual technologies. This book takes an unprecedented look at the practices of observation that emerged from this critical site of encounter, showing how they have informed literary and everyday narratives of America, its citizens, and its possible futures. 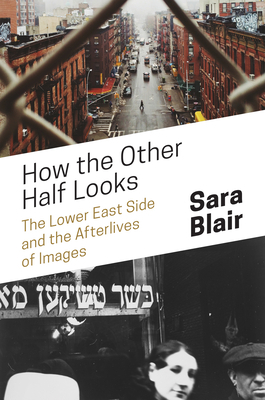 Taking readers from the mid-nineteenth century to the present, Sara Blair traces the career of the Lower East Side as a place where image-makers, writers, and social reformers tested new techniques for apprehending America--and their subjects looked back, confronting the means used to represent them. This dynamic shaped the birth of American photojournalism, the writings of Stephen Crane and Abraham Cahan, and the forms of early cinema. During the 1930s, the emptying ghetto opened contested views of the modern city, animating the work of such writers and photographers as Henry Roth, Walker Evans, and Ben Shahn. After World War II, the Lower East Side became a key resource for imagining poetic revolution, as in the work of Allen Ginsberg and LeRoi Jones, and exploring dystopian futures, from Cold War atomic strikes to the death of print culture and the threat of climate change. How the Other Half Looks reveals how the Lower East Side has inspired new ways of looking--and looking back--that have shaped literary and popular expression as well as American modernity. Sara Blair is the Patricia S. Yaeger Collegiate Professor of English and a faculty associate in the Department of American Culture and the Frankel Center for Judaic Studies at the University of Michigan. Her books include Harlem Crossroads: Black Writers and the Photograph in the Twentieth Century (Princeton) and Trauma and Documentary Photography of the FSA.